Another fabulous new wall for Upfest 2018 – they have done very well this year with opening up these new walls – by Bristol artist 3rdeye. This is an impressive wall but may not have had the foot-fall of other Upfest venues as it was a little off the beaten track. 3rdeye is an artist who cut his teeth on the streets as a graffiti artist in the eighties, but has since developed this further into studio work of paintings and illustrations as well as offering workshops. His rather nice website shows the full range of his work and activities. This wall plays host to a hoard of friendly monsters set on a vibrant orange background. It is a colourful and child-like piece, and all the better for it, and I am particularly drawn to the little monster launching itself off a column which is actually a real feature of the wall of the house. This piece amply demonstrates that street art does not have to be edgy or threatening to be great and that bright child-like ideas have great appeal. Great piece, great wall. I have said it in a previous post, but the children at Ashton Gate Primary School are the luckiest in Bristol. so many pieces decking the walls of their playground. I believe that it was a one-off though, and they’ll not be using the school again for Upfest. The reason for this is that it is a bit off the beaten track, and the artists reported that not many people came to see them working, and they felt a little isolated. 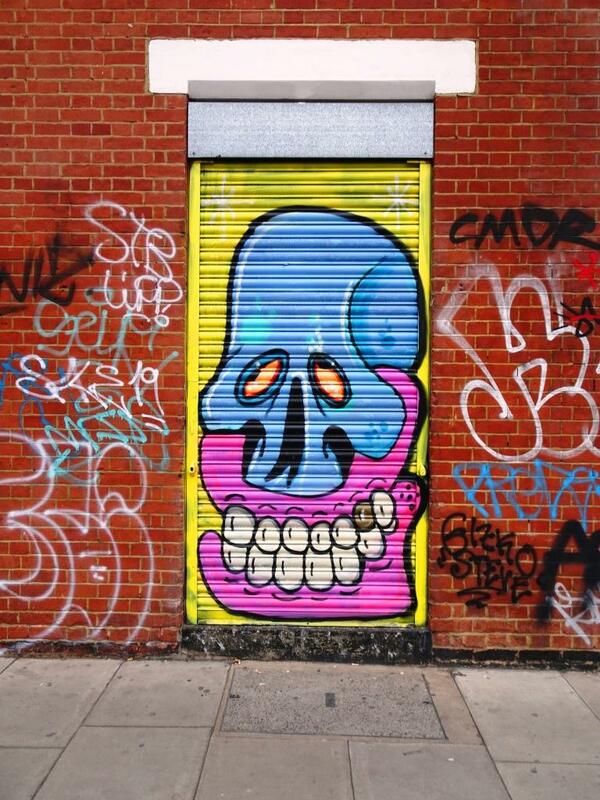 This is a wonderful piece by 3rdeye, an established artist who has been involved in the graffiti scene since the 1980s. His characters are simple and bold but have some emotional depth and feeling. I really like this work. Unfortunately I wasn’t able to photograph it properly, so the composition is slightly out of context. A great colourful piece.